Donald Trump’s firing of James Comey as the director of the FBI has caused a firestorm around the country but for the wrong reasons. Rather than framing Trump’s actions as another example of the unravelling of a lawless and crooked government, the mainstream press has largely focused on the question of whether Trump or Comey is lying. Even worse, the debate in some quarters has degenerated into the personal question of whose “side” one is on regarding the testimony. 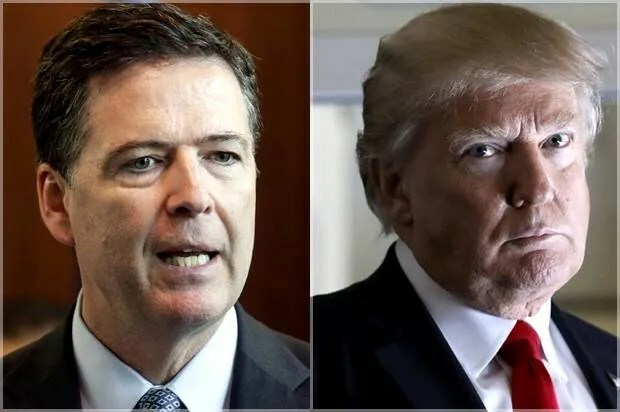 Testifying before a Senate Intelligence Committee, Comey claimed that in meetings with the president, Trump had not only asked him if he wanted to keep his job but had also demanded what amounted to a loyalty pledge from him. Comey saw these interventions as an attempt by Trump to develop a patronage relationship with him and viewed them as part of a larger attempt to derail an FBI investigation into National Security Adviser Michael Flynn’s links to Russia. What Comey implied but did not state directly is that Trump wanted to turn the FBI into the loyal arm and accomplished agent of corrupt political power. In other words, without making a direct allegation, Comey laid out a case for charging Trump with the crime of obstruction of justice. That case is further bolstered by the revelation that Trump is now reportedly considering whether to fire Robert S. Mueller III, the special counsel who was appointed to investigate whether Trump’s campaign colluded with Russian officials. Even Mitch McConnell, the Senate majority leader and Paul Ryan, the Speaker of the House, have publicly stated that this is a bad idea. What many people miss is that rumors of Trump’s possible firing of Mueller are nothing more than part of a politics of diversion — one which constantly shifts the terms of the debate about Trump’s trampling on the rights of the American people and his willingness to divert serious questions about his acts of collusion and obstruction of justice. From a political point of view, we know that one of the biggest flaws in Donald Trump’s presidency, his candidacy, his ability to be president, is that he’s a serial fabricator. Now you have the former top law enforcement officer of this country going in front of the Senate, under oath, saying he — that, you know, “Those are lies, plain and simple,” he said, referring to Trump’s description of his firing. He said, “I was worried he would lie.” He says, “I was worried about the nature of the man.” … And there was a quite funny tweet that went viral last night, which said, you know, “Trump is saying he’s a liar. Comey is saying Trump’s a liar. Well, who do you believe? Do you believe an FBI director who served under two — who served under three presidents from two parties? Or do you believe the guy who said Obama was born in Kenya?” And, you know, that’s what faces us today. Needless to say, given the FBI’s history, Comey being a highly respected director of the FBI — let alone a Republican — does not support the fact that Comey is less likely to lie. But one cannot miss the irony in Trump’s attempt to smear Comey as cowardly by accusing him of lying, given the fact that Trump is a serial liar who has unapologetically declared war not just on the truth but also on critical thought itself. Trump cannot be trusted because he not only infects political discourse with a language of hate, bigotry and lies, but also because he has allowed an ideology built on the use of disinformation to take over the White House. Under the Trump administration, the truth is distorted for ideological, political and commercial reasons. Lying has become an industry and tool of power. All administrations and governments lie, but under Trump lying has become normalized. It is a calling card for corruption and lawlessness, one that provides the foundation for authoritarianism. Trump is a salesman and a bully. He constantly assumes the macho swagger of a used car salesman from a TV commercial while at the same time, as Rebecca Solnit observes, he bullies facts and truths as well as friends and acquaintances. He is obsessed with power and prides himself on the language of command, loyalty and humiliation. He appears fixated on the fear that the United States could still act on the memory, if not the ghosts, of a real democracy. As a former FBI counterintelligence agent, what I saw as the most explosive aspect of the testimony didn’t involve any legal violation of the U.S. code or questions about whether Comey had broken established Department of Justice protocols. Instead, it was the prima facie evidence that Comey presented that Trump appears unwilling to uphold his oath “to preserve, protect, and defend” the country — which puts the security of our nation and its democracy at stake. In the nine times Trump met with or called Comey, it was always to discuss how the investigation into Russia’s election interference was affecting him personally, rather than the security of the country. He apparently cared little about understanding either the magnitude of the Russian intelligence threat, or how the FBI might be able to prevent another attack in future elections…. This … underscores Trump’s disregard for his fundamental duty, which is to ensure the security of the nation, its government and its citizens from foreign enemies. A democracy cannot exist without informed citizens and public spheres and educational apparatuses that uphold standards of truth, honesty, evidence, facts and justice. Under Trump, disinformation masquerading as news — often via his Twitter account — has become a weapon for legitimating ignorance and civic illiteracy. Not only has Trump lied repeatedly, he has also attacked the critical media, claimed journalists are enemies of the American people and argued that the media is the opposition party. There is more at stake here than the threat of censorship or the normalization of lying; there is also an attack on long-valued sources of information and the public spheres that produce them. Trump’s government has become a powerful disimagination machine in which the distinction between fact and fiction, reality and fantasy are erased. Trump has democratized the flow of disinformation, and in doing so, has aligned himself with a culture of immediacy, sensationalism and theater where thoughtful reading, informed judgments and a respect for the facts disappear. He propagates fiction disguised as “news” as a way to discredit facts, if not thinking itself. This practice operates in the service of violence because it infantilizes and depoliticizes the wider public creating what Viktor Frankl has called in a different context, “the mask of nihilism.” Trump capitalizes on a digital culture of immediacy and short attention spans in which complexity collapses in a barrage of tweets and the need for a narrative that offers a sense of consistency and a respite from fear. Trump’s attack on Comey goes beyond a personal insult and act of egregious lying, as well as, in all likelihood, an obstruction of justice. It is also a register of his attempt to discredit criticism and the shared public reality among institutions that is central to a democracy. The dissolution of public goods and the public sphere has been underway since the late 1970s, and Trump capitalizes on that in an attempt to both depoliticize and bind the American people through a kind of dystopian legitimacy in which words no longer matter and anything can be said. He works to undermine the capacity for truth telling and political speech itself. Under the Trump regime, consistent narratives rooted in forms of civic illiteracy and a deep distrust of the truth and the ethical imagination have become the glue of authoritarian power. All of this is reinforced by a disdain for measured arguments, an embrace of the spectacle and an alignment with a banal theater of celebrity culture. In this context, rumors are more important than truth telling. Indeed, in this theater of the absurd, society loses its safeguards against lies, corruption and authoritarianism. In a culture of short attention spans, Trump provides a tsunami of misrepresentations and values in which thinking is done by others, power is exercised by a ruling elite, and people are urged to cease narrating their own experiences and give up their ability to govern rather than be governed. Trump offers his followers a world in which nothing is connected, destabilized perceptions reinforce a politics that turns lethal and community becomes dystopian — unconnected to any viable democratic reality. The reason fact-checking is ineffective today — at least in convincing those who are members of movements — is that the mobilized members of a movement are confounded by a world resistant to their wishes and prefer the promise of a consistent alternate world to reality. When Donald Trump says he’s going to build a wall to protect our borders, he is not making a factual statement that an actual wall will actually protect our borders; he is signaling a politically incorrect willingness to put America first. When he says that there was massive voter fraud or boasts about the size of his inauguration crowd, he is not speaking about actual facts, but is insisting that his election was legitimate. ‘What convinces masses are not facts, and not even invented facts, but only the consistency of the system of which they are presumably part.’ Leaders of these mass totalitarian movements do not need to believe in the truth of their lies and ideological clichés. The point of their fabrications is not to establish facts, but to create a coherent fictional reality. What a movement demands of its leaders is the articulation of a consistent narrative combined with the ability to abolish the capacity for distinguishing between truth and falsehood, between reality and fiction. As important as the Trump-Comey affair is, it runs the risk of both exacerbating the transformation of politics into theater and reinforcing what Todd Gitlin refers to as Trump’s support for an “apocalyptic nationalism, the point of which is to belong, not to believe. You belong by affirming. To win, you don’t need reasons anymore, only power.” Trump values loyalty over integrity. He lies, in part, to test the loyalty of those who both follow him and align themselves with his power. The Trump-Comey affair must be understood within a broader attack on the fundamentals of education, critical modes of agency and democracy itself. This is especially important at a time when the United States is no longer a functioning democracy and is in the presence of what Zygmunt Bauman and Leonidas Donskis refer to in their book Liquid Evil as “the emergence of modern barbarity.” Trump’s discourse of lies, misrepresentations and fakery makes it all the more urgent for us to acknowledge that education is at the center of politics because it is crucial in the struggle over consciousness, values, identity and agency. Ignorance in the service of education targets the darkness and reinforces and thrives on civic illiteracy. Trump’s disinformation machine is about more than lying. It is about using all of the tools and resources for education to create a dystopia in which authoritarianism exercises the raw power of ignorance and control. Artists, educators, young people, journalists and others need to make the virtue of truth-telling visible again. We need to connect democracy with a notion of truth-telling and consciousness that is on the side of economic and political justice, and democracy itself. If we are all going to fight for and with the most marginalized people, there must be a broader understanding of their needs. We need to create narratives and platforms in which those who have been deemed disposable can identify themselves and the conditions through which power and oppression bear down on their lives.